This first “First Two Pages” of the new year celebrates a great story from last year: “The Night They Burned Ms. Dixie’s Place” by Debra H. Goldstein from the May/June 2017 issue of Alfred Hitchcock Mystery Magazine. This was Debra’s first story for AHMM, and it’s such a fine piece that she earned a cover mention for her debut there! Debra was a great friend of Bonnie Stevens, who launched the “First Two Pages” blog series. One of my favorite evenings at Bouchercon in New Orleans was a dinner I shared with Debra, Bonnie and her husband Dennis, Paula Benson, and Riley Miller—and at Bouchercon Toronto, Debra, AHMM editor Linda Landrigan, Linda’s husband John, and I got together with Dennis Stevens and his daughter Rachel for an evening remembering Bonnie, one of the highlights of our visit to Toronto as well, though under circumstances none of us would’ve wanted. 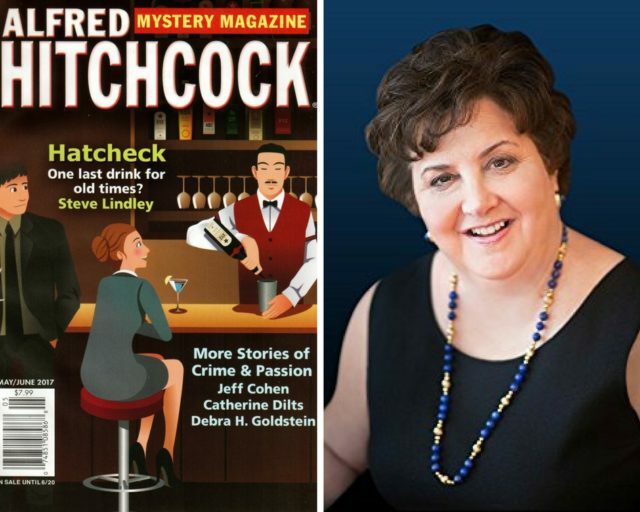 In addition to her writing—including her latest book, Should Have Played Poker, and her upcoming Sarah Blair mystery series—Debra is also a leader in the crime fiction community, having been on the board of Sisters in Crime for many years and more recently stepping up as president of SinC’s Guppy Chapter. You can find out more about Debra at her website.